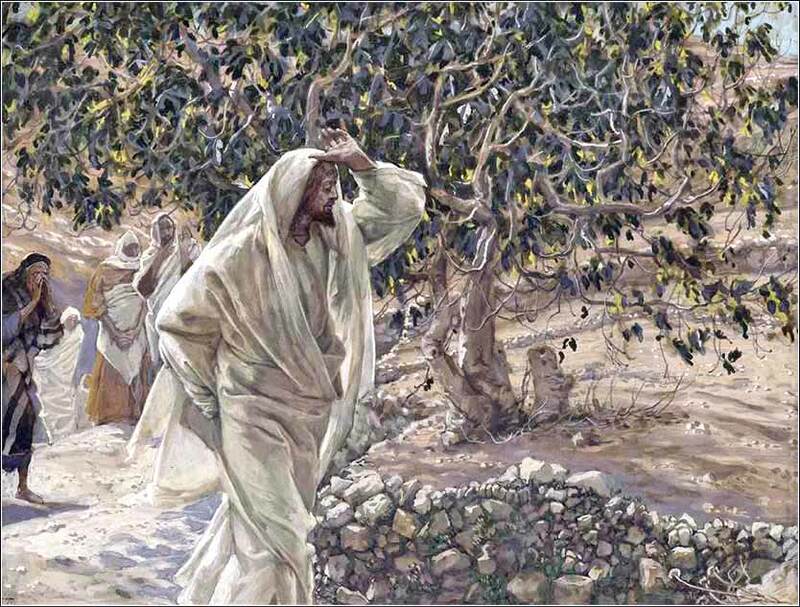 The Accursed Fig Tree (Le figuier maudit) by James Tissot, ca. 1886. 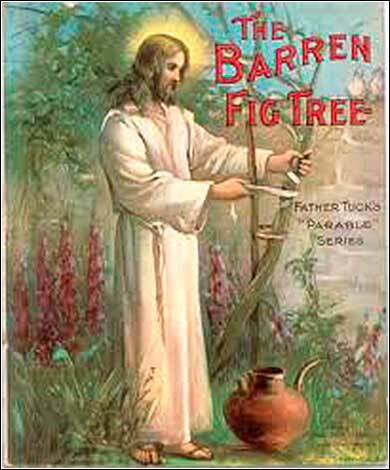 Father Tuck’s Parables were published, ironically, by Raphael Tuck & Sons, Orthodox Prussian Jews who immigrated to London in 1865. Notice the foxgloves, so typical of an English garden. In the midst of the paths of justice. The timing of this demonstration and its concreteness inform us that Jesus seeks to apply the general principle of Matthew 7 to the specific situation: His imminent arrest and execution. He is, bluntly, cursing Israel and Judaism. It is not retribution for the act they are about to commit; Jesus is not seeking revenge for his death, for his death is the will of God, a sacrifice for the salvation of the Jews and all nations. Rather, the day of the old covenant is over. Judaism, as a religion and as a nation, is about to become a discarded husk, a skin that has been shed. The caterpillar or pupa will become a butterfly, and Israel will become no more than the lifeless reminder of a previous age. From another perspective, it is not actually Christ's crucifixion that will destroy Israel, but his resurrection. God has provided a fruitful road to righteousness and salvation. Or to say it yet another way — and probably the most correct theological way, for it is a central point of Paul's Epistle to the Romans — the purpose of Mosaic Law was to give us a yardstick by which we could measure our conduct and see that we were sinful. And the purpose of Judaism was to show that we could not attain righteousness before God by our actions. Now, having served its purpose, God will abandon the old covenant.